METABOLISM, WHAT'S THE BIG DEAL? The word, metabolism, has a bad reputation and is probably the most poorly-understood aspect of our health. Though nutrition experts have some sugar coated words about it, many are still confused about what it means and what factors influences it. Your body has this amazing capacity to repair, grow, heal, reproduce, and stay alive, and that's why it's a big deal! 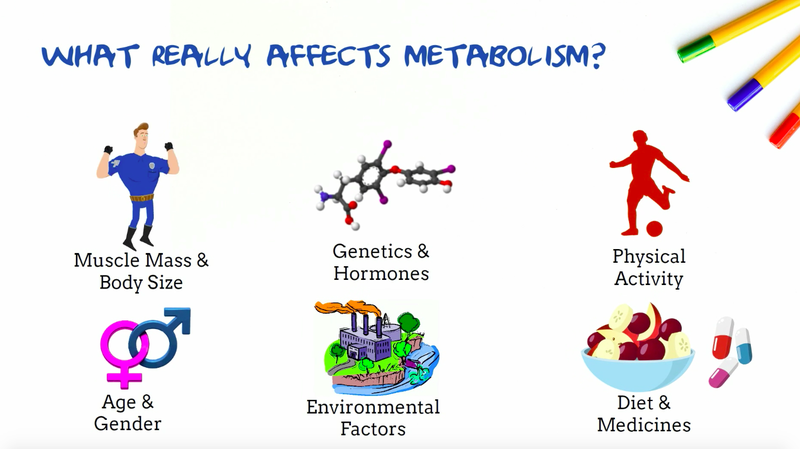 Metabolism is what you get when you add up all the chemical reactions in your body. It is the rate at which the cells in your body produce energy. You need these biochemical processes to maintain life. So, when it comes to weight loss, people tend to carry this common belief. Slim people are slim because they have a higher metabolism and overweight ones have slower metabolism, but that’s rarely the case. There’s a lot happening out there. You take a look inside of a cell, there are trillions of them in your body, you have both these processes taking place all the time. When you bring food molecules into your body, i.e., carbs, proteins, and lipids (fats) for digestion, you are immediately on a catabolic process, which means you are going to break the big molecules down into small pieces. During this process, energy is released for the cells to do its work. Also, the same energy is used for anabolic process, which is basically a building up process. 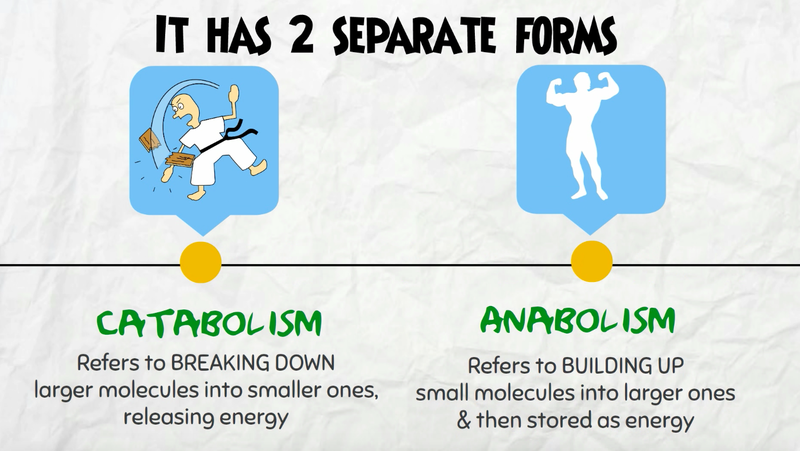 So, the food molecules are broken down into smaller molecules for energy and the smaller molecules are stuck together during the rebuilding process (anabolism). The breaking down process is called catabolism and the building up process is called anabolism and metabolism is the balance of these two processes. The breaking down & building up! Your body need energy for physical activity, right from the cellular level to whole body movements, and you receive energy through the process called catabolism. 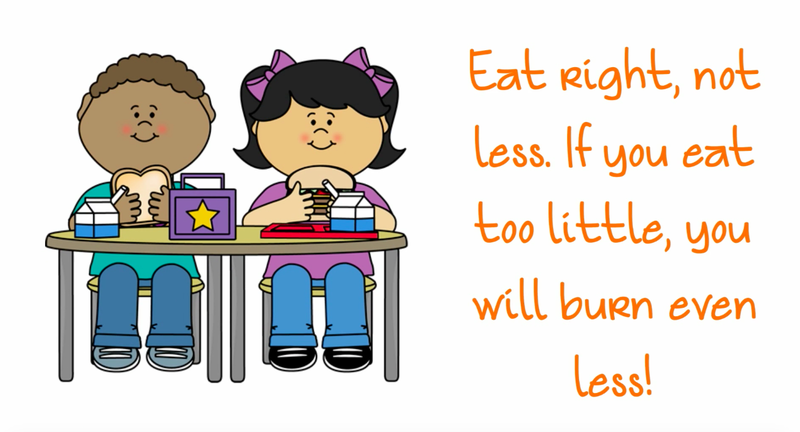 The food you eat get digested when you eat something; your body breaks down the organic nutrients (carbohydrates, fats, proteins). The energy that gets released during this process is stored in ATP molecules (adenosine triphosphate) in the body and your body uses it whenever it needs it. ATP is considered to be "the energy currency of life." 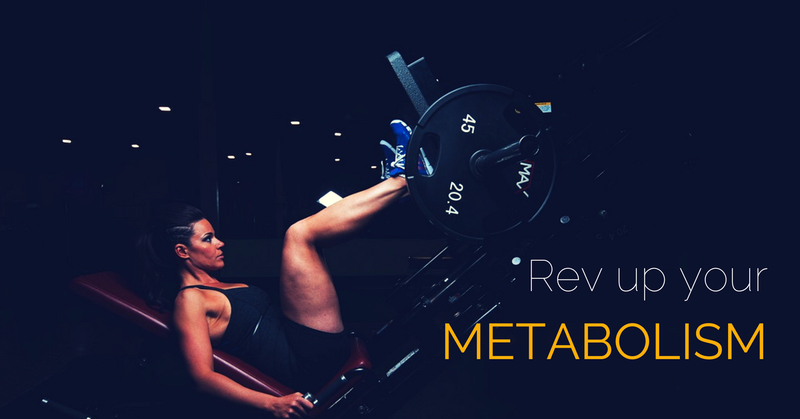 In order to decrease your body fat percentage and to lose weight, you need to keep your body in a catabolic state. A catabolic state means that your body is breaking down tissue. Whenever you workout, whether it's cardio or weightlifting, you're causing tiny tears in your muscle. Jogging, high intensity interval training workouts, cycling, swimming and other forms of aerobic workouts are great for decreasing the total fat mass. The longer and harder you workout, the more damage you'll cause to your muscle tissue. Whereas during the process of anabolism, your body is building or repairing tissue. Simple molecules such as amino acids are built up into larger and more complex molecules. You achieve the anabolic state through strength training and adequate nutrition. Your body won’t be able to build muscle tissue without the nutrients required while in the anabolic state, so it’s important for you to get enough protein and carbs before and after your workout. Also, after your workout, you need to get enough sleep and rest. When you rest, your body goes into damaged muscle tissue and begins repairing it. It's during rest, not exercise that you actually put on all of your size. So, how does it affect your body weight? Your body weight is a result of catabolism minus anabolism. You gain weight because of energy imbalance. In simple terms, your body weight is a result of catabolism minus anabolism. In other words, the difference between the amount of energy you release into our bodies and the amount of energy your bodies use up. Using up energy required to keep your body functioning at rest; this is known as your basal metabolic rate (BMR). Generally, you become overweight a result of the body storing excess energy as fat, but sometimes it can be due to hormonal problems or an underlying medical condition as well. So, if you are you overweight? It’s worthwhile to seek a medical evaluation. Mostly, the reason why you’re being overweight is not because of a slow metabolism, it all depends on how much you eat and drink and how much you burn. 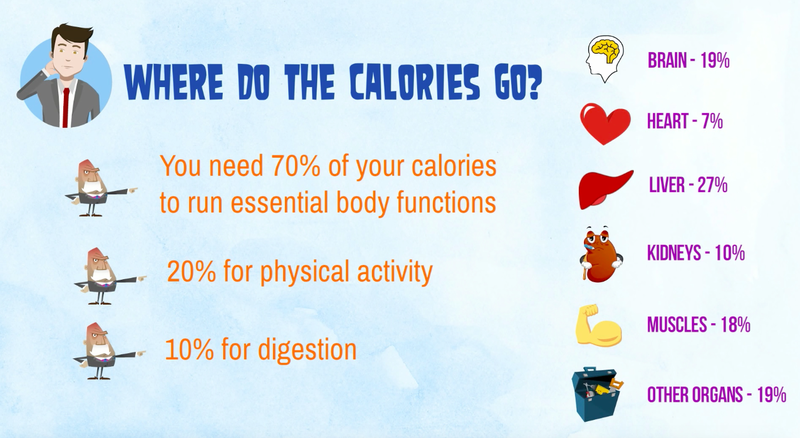 The more active you are, the more calories you burn. As you age, several factors emerge which result in a lower calorie requirement. As you get older, you tend to gain fat and lose muscle. One of the reasons why your BMR decrease with age. You should focus on three crucial factors associated with weight loss and maintenance of your ideal body weight. They are exercise, dietary intake (nutrition), and quality sleep! Thanks Sophia. Glad you liked the post!